The recollection of these words evoked bitter irony last week. Kennedy’s career was threatened not by a violent enemy or a political foe but by a scandal that revealed a shocking lapse of judgment and control. Harried SeclusionKennedy’s lost night on Chappaquiddick off Martha’s Vineyard and the mystifying week that followed brought back all the old doubts. 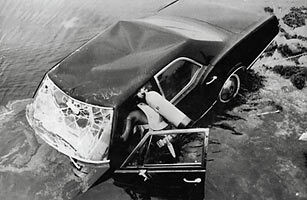 For approximately nine hours after the car that he was driving plunged from Dike Bridgeâ€”carrying his only passenger, Mary Jo Kopechne, to a death by drowningâ€”Kennedy failed to notify police. After his first brief and inadequate statement at the station house, his silence allowed time for both honest questions and scurrilous gossip to swirl around his reputation and his future. Only once did the Senator leave the harried seclusion of the Kennedy compound at Hyannisportâ€”when he flew to the funeral at Plymouth, Pa., still wearing a neck brace he received after the accident. The Kennedy debacle became a topic of more interest in much of Washington and elsewhere in the country than man’s landing on the moon. Americans in Saigon discussed the case more than they did the war. Politicians began weighing the practical repercussions: What of his Senate seat The party’s future One Republican National Committee official even noted that Kennedy’s value as a Democratic fund raiser had been destroyed. Finally, at week’s end, Senator Kennedy did break his silence. Through his lawyers, Kennedy withdrew his opposition to the misdemeanor proceedings against him, waiving a hearing scheduled for this week. He then pleaded guilty at Dukes County Courthouse in Edgartown to a charge of leaving the scene of an accident. That night Kennedy went on all-network TV to tell his story of what happened before and after the accident and to make an artfully emotional appeal for the guidance of the Massachusetts electorate as to whether he should resign from the Senate. For all of its pain, the courtroom was probably the easier ordeal. Arriving 25 minutes before the 9 a.m. trial was to begin, Kennedy, accompanied by his wife Joan and his brother-in-law Stephen Smith, looked like a ruined man, the strain clearly showing in his drawn face. When the clerk asked for his plea, the Senator softly replied, “Guilty,” then, after a second, “Guilty,” in a louder voice that all the reporters and onlookers who crowded the 1840-vintage courtroom could hear. He uttered no other word during the nine minutes the proceedings lasted. Judge James Boyle pronounced sentence: two months in a house of correction, suspended for a year. Kennedy was not on formal probation, but he was made subject to the court’s jurisdiction for twelve months. Prosecutor Walter Steele requested that Kennedy be spared imprisonment, as did one of Kennedy’s three lawyers, saying that the “reputation of the defendant is known to the court, and to the world.” See TIME’s complete Ted Kennedy coverage. Among the swine flu mysteries: Why only deaths in Mexico?